6 a.m. came quickly and we cheered to not be greeted with fog, that one element that could delay our start. Checked AIS to see what other boat traffic was about before heading out into the channel. Smaller boats don’t use the main channel; we must use the north or south auxiliary ones, thus keeping out of the way of the BIG ships. Fine with me. As we’re about to cross into our channel, a large container ship approaches and Russ actually thinks he can get across in time. Right at that moment, we hear an alarm and I race about trying to figure out which one it is, as it’s not coming from the chartplotter. It stops before I can identify it, but it distracted the Captain those few seconds, long enough for him to decide to let the big ship pass before continuing.Phew. A mile or so before our turn north is the Chesapeake tunnel; it has bridges on either side into the water, but the tunnel allows all boats to pass without the worry of a bridge. 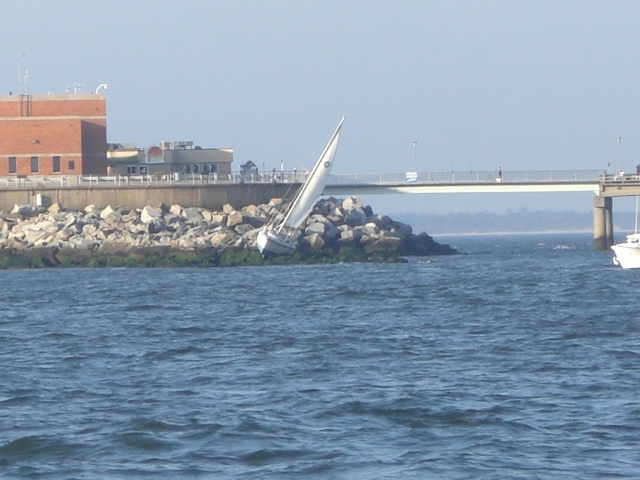 Right on the rocks where the bridge ends and slides into the water, we see a 30′ monohull aground, sails still raised. So spooky; it must have occurred the night before. A few hours later the Coast Guard issues a Pan Pan (pon) about this very boat; still with running lights on and the people safely off their boat. Must have been mechanical; no fog last night. On the rocks.. but he ordered straight up! Up the coast we go on our merry way; the sun shining and the wind cooperating; by 10:30 we are sailing along. The seas are better than expected and we are giving thumbs up to the forecast; for once. 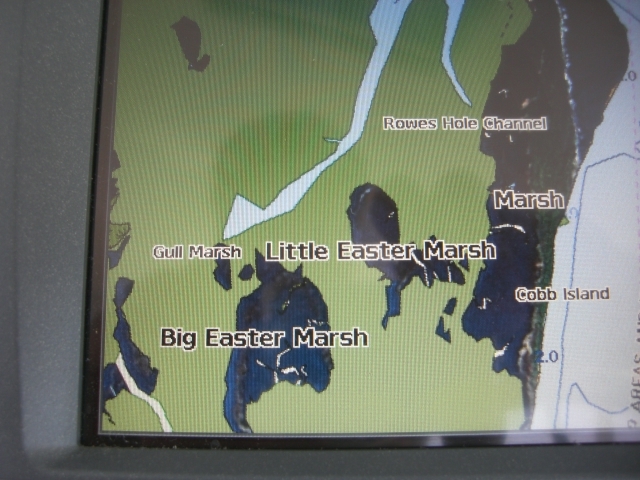 We pass by Little and Big Easter Marshes; are we in the right place at the right time or what? Russ naps a bit so that he can stay up as much of the night as possible while I read at the helm and say my usual prayers for an uneventful night’s passage. We sailed some, motored more and were extremely pleased with the sea state; while the waters ran the gamut, they never were more than swells of 4 ft, from behind- a smooth ride indeed. Sunday evening we saw an angry line of T-storms on the radar, heading north-east. We made sure to keep our speed down so that we wouldn’t catch up to them (smile) by quickly taking down the main. That was weird- in the dark, can’t see a thing, relying on instruments only. The sky darkened, the wind kicked up and ahead we could see the sky lit up by the wild lightning show. Was kinda scary being this little speck on the open water, the entire sky all stormy and knowing somewhere was getting a direct hit. The rest of the night was uneventful what little was left of it after the weather cleared. We passed by the entrance to the Delaware River around 2am. It’s a good sized entrance with several major ship channels. Anchored ships stood waiting for the pilots to bring them in and we only “saw” one tug and barge heading in as we passed. OK- done and I hit the sack for a few hours, getting up again at 6am. We raised the main once I was up, but the wind refused to cooperate and down it came within an hour. The good side to that was it was easier for me to be at the helm while Russ caught some ZZZs. Keeping a watchful eye on the “time of arrival” we kept our speed up (6.5 kts or better) as much as possible using whatever combination of engines and sails would do the trick. The magic time hovered around 7pm. 8pm was the absolute deadline as by then it would be dark and no way did I want to arrive and anchor in the dark. Then the fog joined the party and was one of those guests who just do not know when to leave. It stayed with us over 6 hours and while we didn’t anchor in the dark… beating that deadline by mere minutes, we did do it in the fog. Up until the last hour visibility was crappy, about 200-300 yds and not much boat traffic. Radar was working fine and my eyes were nearly always glued to the Strataglass. By 7pm as we continued to lose daylight, visibility worsened- oh joy- to 200 yds at best. By some miracle the occasional lobster pots we’d been dodging pre-fog became very rare, but that might well be due to our inability to see very far! We anchored at Sandy Hook on our trip south, which gave us a minds-eye visual- always helpful when one is going in blind. At 8pm we dropped the anchor just off the small Coast Guard Station, checked in with David who was expecting our call by 8pm at the latest and thanked Mother Nature for the challenge she allowed us to meet. After stuffing our faces with guacamole and cheese and crackers, we crashed to the best night’s sleep I’ve had in many months. Morning dawned clear and sunny. We were surprised to see that we’d spent the night 200yds from fish traps. Yes, the chart had the area noted; sure would have ruined our day to have run into that jumble of stakes and nets. This entry was posted in Uncategorized and tagged east coast fun, Hair raisers, night sail. Bookmark the permalink.